It's been a long seven years, and now President Obama has one last grandiose, primetime engagement throughout living rooms across America: the 2016 State of the Union address, the last one he'll deliver as president. It'll be going down at 9 p.m. ET on Tuesday night, and it could prove to be a pretty interesting watch, considering all the big changes on the horizon. But what about this year? What's the big change in this State Of The Union? Here's one for you, especially if you're into politics and the familiar faces of the Washington, D.C. scene ― John Boehner won't be there anymore! 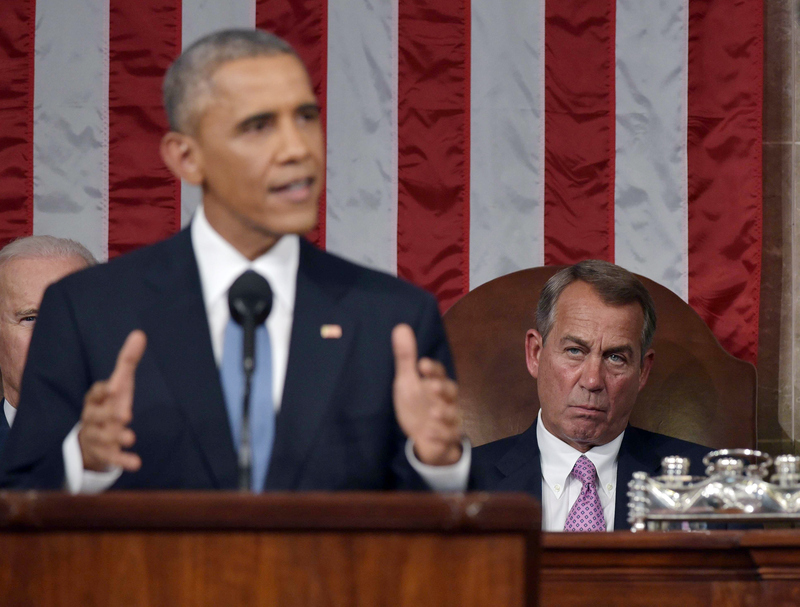 Surely you remember the sight of Speaker Boehner's face floating behind the president in addresses from previous years. It's customary for the Speaker of the House to be seated behind and to the left of the president during the State of the Union, flanked by the vice president to their right. It's usually a pretty matter-of-fact, staid gig, but Boehner actually had a notably emotional moment during his first State of the Union as Speaker, much more so than you typically see. It happened back in 2011, when Obama referenced his ascension to the Speakership as an example of the American dream, causing Boehner to visibly tear up. It was just one of many times throughout his career that he'd publicly weep, but it was a very memorable moment, even though Obama recycled the line years later to much less effect. Considering that it's getting toward the end of Obama's tenure, his address will probably be a little more backward-looking than forward, a last, high-profile chance to pitch his accomplishments to the American people before history takes over. This also means that losing Boehner from the broadcast shot might just be the most meaningful change especially considering who's taken his place ― freshly minted Speaker Paul Ryan, who inherits the weighty responsibility for deciding which (if any) of Obama's lines to visibly applaud. Unfortunately for viewing audiences everywhere, however, Ryan reportedly shaved his beard earlier this week. It's possible that pat of the decision was made knowing that he'd be on camera so prominently come Jan. 12, but whatever the reasoning, that deprives everyone of a rare sight. As Time detailed, Ryan was the first Speaker in 90 years to sport one, and as such, it would've been the first time in the speech's broadcast history that you'd have seen a bearded face in the back row. For that matter, it'll still be a broadcast first by virtue of Ryan's integral role in the 2012 presidential race. It's alarmingly easy to forget sometimes, but just three-and-a-half years ago, Ryan was the bottom half of the Romney/Ryan ticket, and he had to square off in a nationally televised debate against the very guy he'll be sitting next to on Tuesday night, vice president Joe Biden. You've got to wonder if there's any residual awkwardness there. But furthermore, he's just the third person to serve both as Speaker of the House and as his party's nominee for vice president, alongside Schuyler Colfax for the Republicans in 1868, and John Nance Garner for the Democrats in 1932. Ryan also stands alone as the only of the three to lose his vice presidential bid, and the only one to become Speaker after their vice presidential run. Which reminds me ― when you're watching Obama speak, and you see Biden and Ryan sitting behind him, it'll probably feel like somebody's missing, right? Where's Mitt? They at should at least invite him to the address to get a 2012 reunion selfie with the guys after it's all over with.